It's not just that airplanes have been disappearing, or shot down, or that the infectious disease Ebola is out of control in parts of Africa, or that Tel Aviv travel was suspended by major airlines when shelling came too close to the airport . Travel risk has always been an issue for corporations whose employees are spread round the globe. In this morning's New York Times article, Joe Sharkey goes inside a gathering of corporate travel managers to better understand their concerns, including legal and ethical risks, given the last week or so of travel events. If you're traveling on your own and don't have a corporate travel office to rely upon to filter out threats and make best recommendations, then your best bet is to go to the Department of State's website and read through the threat analysis they perform on countries you might visit. 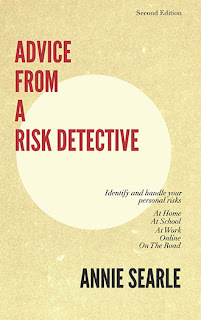 If you're just learning to travel, then the "On The Road" chapter of Advice From A Risk Detective will be of use. No one wants you to stop traveling. But we do want you to make safe choices at a time when many parts of the world are less stable than usual.